Red Bellied parrots, Poicephalus rufiventris, are sweet, gentle spirited little birds. The males have dark gray on the wings, a lighter gray on the head, often with orange, and a dark orange belly. The females are dark gray on the wings, lighter gray on the head, and light gray mixed with pale orange and green on the belly. They originate from Eastern Africa in Ethiopia, Somalia, Kenya and Tanzania. Red Bellies are about 8-9 inches in length, and weigh approximately 110 to 125 grams, the females tending to be smaller than the males. Red Bellied parrots love to cuddle and are playful. They may roll around on their backs and wrestle with toys and each other, but when they get tired, they enjoy nestling under the chin. They have sweet, soft voices, musical calls and they are reputed to be the best talkers within the Poicephalus parrot family, though they sometimes do not talk clearly. Red Bellied parrots sometimes go through phases where they are either bold, or terrified of the whole world, alternating from one minute to the next. When they go through a fear stage, it is very important to keep things as calm as possible and encourage them to feel safe. They all go through this stage, some individuals multiple times. They will eventually come out of it and become their bold, playful selves again, so don't worry. Red Bellied parrots are incredibly affectionate and love to be cuddled and held close. A trusting Red Belly enjoys being skritched all over and will even lie on his or her back in your hand. Because Red Bellied parrots are so gentle and calm, they do well with children who are well behaved and calm themselves. 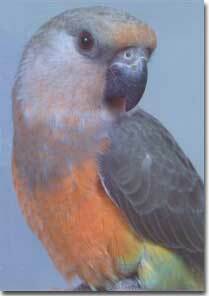 Red Bellied parrots bring a delightful spirit into a good home.